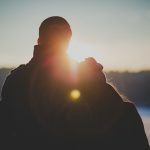 Choosing somewhere beautiful and romantic for a honeymoon can be very difficult. Since our wedding was in the Spring, we had to find a destination that was perfect for that time of year. 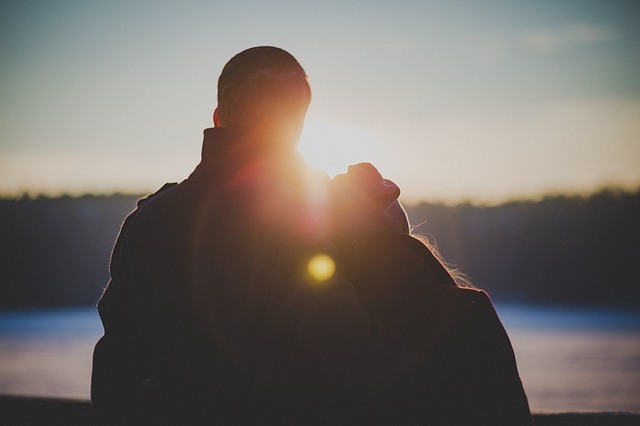 We wanted somewhere warm, with a lot of history and culture, beautiful hotels, fabulous restaurants and lots of things for us to see and do together as a couple. 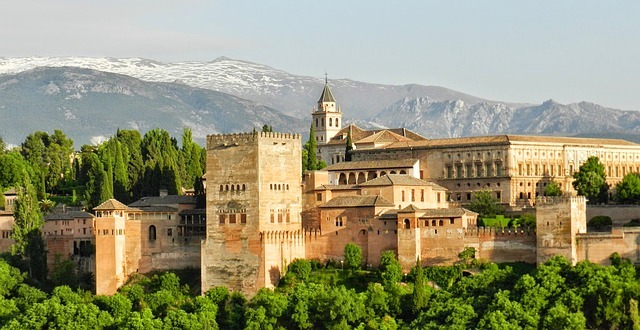 Granada is Spain ticked all the boxes. We found this cute little boutique hotel, the Hospes Palacio de los Patos, which is a 19th Century palace with modern decor. Our room was so big and gorgeous, with ornate friezes, a silver domed ceiling and marble bath tub. Our hotel recommended a very romantic restaurant, the Mirador de Morayma Carmen Restaurant, on top of Albaicin. 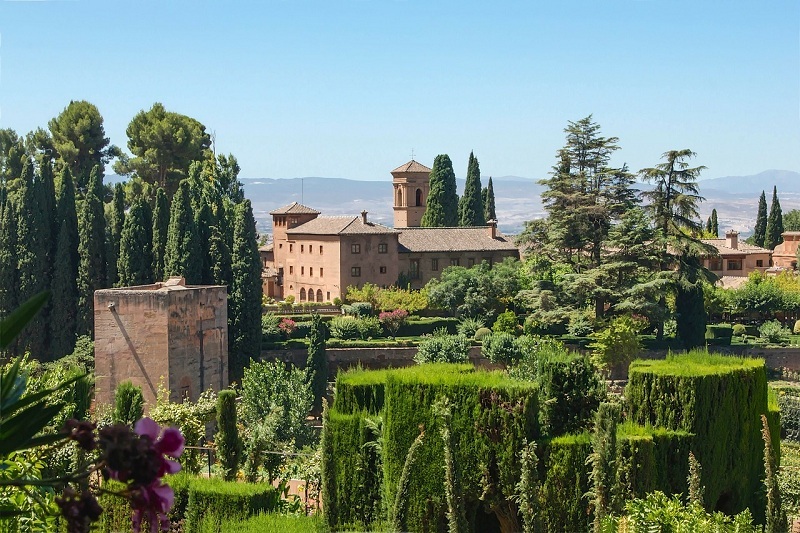 It is set in a carmen and has an outdoor garden with an amazing view of the Alhambra at night. The hotel told them we were there on our honeymoon and we got the best table with a bottle of champagne waiting for us. 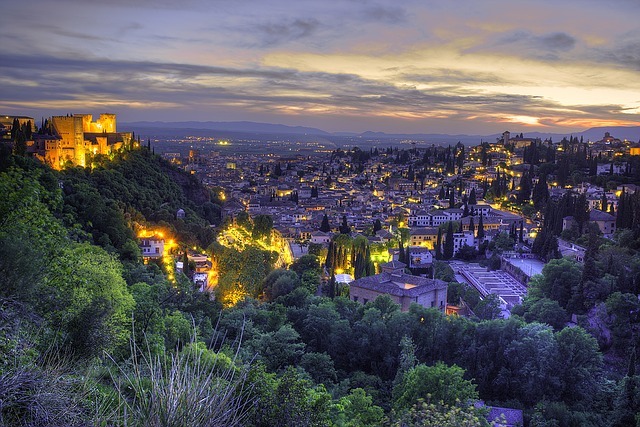 Sipping champagne and watching the sun set over the Alhambra was one of our most romantic moments. The next day, we spent exploring the Alhambra Palace. It is enormous, made up of a lot of palaces, gardens, towers and turrets. We really loved seeing the Palacios Nazaríes with its intricate tiles and exotic carvings. 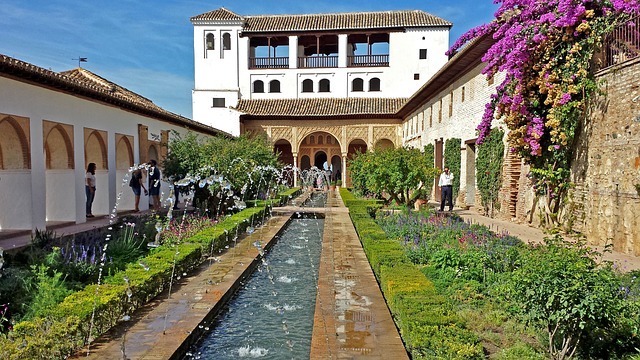 Just walking through those buildings transports you back to the time when the Moors ruled Granada. It’s a great place for taking lots of great honeymoon photos. We went back to the hotel to spend an afternoon by the pool. They have private couples’ sun loungers with curtains for privacy. Christian surprised me with a couples massage in the hotel’s luxurious Palacio Bodyna spa. The next day, we went in search of more history and found the beautiful old palaces of The Carrera del Darro and the Paseo de los Tristes. Just next to this is Plaza Nueva which has lots of little tapas bars. It was a lovely place to walk around and made our own tapas trail. Later, walking around the Albaicín quarter, we found an old Arabic tea shop, As-Sirat where we stopped for some tea and pastries. Since Flamenco was born in Andalucia region, we had to find a place that had dancing. We went to the Sacromonte cave-quarter where all the flamenco dancers, guitarists and singers congregate. We whiled away an evening drinking local wine at the Los Faroles. Christian and I even learnt to dance some Flamenco. We found so much to see and do in our time there. Granada in Spain was just the perfect place for our honeymoon and we took home a lot of incredible memories.